But saved is sozo and means delivered, healed, prospered, wholeness – nothing missing, nothing broken. We were WHOLE IN Christ before time eternal. v. 10 – but now is made manifest (or revealed) by the appearing of our Savior Jesus Christ! We have to read these verses in Ephesians in the context of eternal – before time existed; before creation; before the foundation of the world. Our error was to make, “being made holy and blameless, time sensitive.” The time we pointed to, was a little over 2,000 years ago. God said it took place before the realm of time; from eternity backward. Jesus willingly went to the cross, not to bring about that which was always true of man; but to reveal what is eternally true of man. We are to rest not just in an event that took place over 2,000 years ago; it includes that, but our rest is in what Jesus revealed to be true from before the foundation of the world. Isaiah 46:10: Declaring the end from the beginning and from the ancient times the things not yet done, saying My counsel shall stand and I will do all My pleasure. First time we see the word is when God said to Adam – who told you that you were naked? God’s declaration of the end from the beginning stands boldly opposite of what may “appear” to be real in the earth… what men may be declaring about themselves and about Him. Genesis 1:26: And God (Elohim – Father, Son and Spirit) said, “let Us make man in Our image and according to our likeness so that they will have dominion (over all things). What is God’s image and likeness? Jesus came and revealed what was ALWAYS true of us from the beginning – before creation. and as He is so are we…. sons and heirs from before creation! Ephesians 1:5: He predestined (before creation) us INTO sonship through Jesus Christ into Himself according to His good pleasure and will. 2 Cor 11:3 – Paul is talking about our minds being corrupted away from the singleness and blamelessness in Christ and likens it to the serpent deceiving Eve. His purposes.. His counsel will STAND! Genesis 1:30 is that thought declared good: And God saw everything that he had made, and, behold, it was very good. And the evening and the morning were the sixth day. And then He rested…DONE! FINISHED! HIS COUNSEL/PURPOSE WILL STAND! His purpose will stand and He will do all His pleasure – your mistakes didn’t change that! This verse is ALL God! synonyms of resolve are firm, fixed, decided, concluded. what I hear in that is DONE! FINISHED! Master of ALL — SONS! we are still seeking to appease God through our behavior… living under an IF and THEN law with God… IF I do this, THEN God will bless me, give me more favor, anointing, abundance, healing, etc. We’ve got to grasp IT IS FINISHED! WE are sons! we thought that maturing as sons was a process. Galatians 4:5-6: But when the fullness of time had come, God sent forth his Son, born of woman, born under the law, 5 to redeem those who were under the law, so that we might receive adoption as sons. What was he dead to? Luke 15:21: I have sinned against heaven and before you; no longer am I worthy (deserving) to be called your son. Make me as one of your hired servants. The father’s response: Said the father to his servants, Quickly bring out the best robe and clothe him, and give him a ring for the hand and sandals for his feet! Paul’s not correcting himself — what he’s doing is saying you’ve known God, but I want you to know that you are FAR MORE known by Him – from before the foundation of the world! 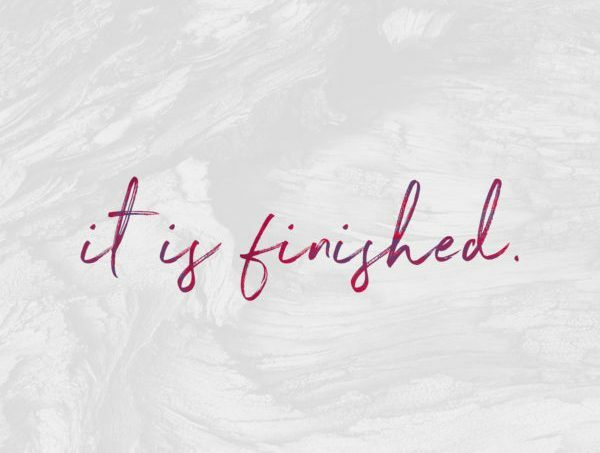 God – Elohim – Father, Son and Spirit say about you – You are FINISHED! You are perfect, complete, lacking nothing – WHOLE! Simply wake up to what God has ALWAYS known about you and walk in it… Just BE! Ephesians 1 – part 2 – Wholeness BEFORE the foundation of the world!